The recent spy swap between the United States and Cuba puts an end to 50 years of wrangling between the two countries. Washington finally decided to smoke the peace pipe with the Castros, kiss and make up. Conservatives and anti-Castro groups are outraged, and that's an understatement. They see it as capitulation after over 50 years of cold war with the little squirt down south. As a token of good faith, the U.S. released the remaining three Cuban Five prisoners and Cuba paid back in kind by releasing communications spy Alan Gross. The deal also included a mysterious Cuban national who President Obama credited with helping expose Cuban spies such as the Cuban Five, Ana Belen Montes, and Kendall and Gwen Myers. However, unlike Alan Gross who took the spotlight and gave a press conference, this agent, who came on the same plane that landed at Andrews Air Force Base near Washington D.C., was whisked away secretly to an undisclosed location. His name was 'leaked' to the press by an anonymous intelligence official of the United States and the story of why the spy is so important and why he was included in the swap was read off a carefully worded text by Brian P. Hale, an expert with an extensive career in dealing with the media. Everyone from the NY Times to the LA Times quickly picked up on the story quoting these sources and each other. The entire frenzy is actually a study in how information is manipulated in the U.S. and how popular opinion is formed. To help the Obama Administration make its case, Raul Castro, the president of Cuba also remained silent on the mysterious spy that Fidel's Revolution coughed up. The U.S. and Cuba may not agree on much, but here they had to cooperate, and that was one of the things that obviously was negotiated between the two sides: the U.S. would handle the public relations aspect of the swap and Castro would remain silent. Cuba had nothing to lose by putting their three heroes on TV shaking hands with Raul Castro any more than President Obama had anything to lose by putting Alan Gross on camera. None of these agents had to be 'debriefed' or checked by the doctors before appearing in front of the cameras. The only reason people strongly suspected that the mysterious spy might be Rolando Sarraff Trujillo (a.k.a. Roly) is that his family can't find him. Cuban prison officials told them that their son had been transferred, but not to worry about him. He was in 'good hands'. Certainly, Roly fit most of the description made by Obama at his press conference announcing reestablishment of relations with Cuba: a Cuban intelligence officer locked up for 20 years for providing cryptographic information that led to the capture of the aforementioned spies. So who else could it be? And if in addition the Obama Administration 'carelessly leaks' the name through 'unidentified official' sources, we have the makings of what appears to be 'disinformation'. Editor’s Note: Cuba recruited Guillermo “Bill” Gaede in the mid-1980s to steal information on computer software and provide it to case officers in Mexico. Havana, in turn, passed the information to the USSR and East Germany until the end of the Cold War. Gaede, an Argentine communist and software engineer, worked for Advanced Micro Devices, Incorporated in Sunnyvale, California from 1979-1993. He provided Cuba with AMD specs, designs, “Blue Books,” masks, wafers, and small measuring devices. He claimed his initial motivation was his belief in communism, but this motivation waned after he repeatedly traveled to Cuba and became disillusioned. He left AMD in 1993 because of mistaken fears that the company would soon detect his misconduct. Intel then hired him and greed became his motivator. He began committing espionage for China and Iran, which paid him handsomely. On a personal note, analysis of Bill Gaede’s current and previous writings found numerous errors, based in part on his flawed interpretation of facts and a predisposition to see conspiracies everywhere. El fugitivo de Estados Unidos y agente renegado de la CIA Frank Terpil sigue viviendo en La Habana y rememora con toda tranquilidad la época en que ayudaba al dictador libio Muammar Gadafi a asesinar a sus enemigos, según un documental británico recién estrenado. El coproductor Michael Chrisman dijo que Terpil, de 74 años, fue entrevistado en su casa de La Habana en diciembre y dio la impresión de llevar una vida un tanto aburrida “con poco que hacer, (y) pasa mucho tiempo con un trago en la mano en los bares de La Habana”. Terpil tiene una novia cubana mucho más joven que él, y pide a amigos y visitantes que le traigan de vez en cuando algún libro en inglés, dijo Chrisman. El documental de Showtime se llama Mad Dog: Inside the Secret World of Muammar Gaddafi ( Perro rabioso: dentro del mundo secreto de Muammar Gadafi). La entrevista se centró en las relaciones de Terpil con el dictador libio, muerto en una revuelta en el 2011, y no en sus vínculos con sus anfitriones cubanos porque “sin duda él estaba corriendo peligro de disgustarlos al conceder la entrevista”, agregó el coproductor. Terpil, operativo de la CIA que renunció a la agencia en 1970, es uno de más de 70 fugitivos estadounidenses de quienes se reporta que se han refugiado en Cuba. Muchos son considerados por La Habana como víctimas de la persecución política de EEUU, como es el caso de la militante afroamericana Joanne Chesimard. El huyó de Estados Unidos en 1980 para escapar un encausamiento federal bajo cargos de conspiración para cometer asesinato y de entregar más de 20 toneladas de explosivos plásticos a Gadhafi y despues apareció en el Líbano, pero finalmente se refugió en Cuba. La Dirección General de Inteligencia de Cuba reclutó a Terpil, le dio el nombre en clave de Curiel –conejillo de Indias– y lo usó en 1987 para tratar de reclutar a un agente de la CIA en Checoslovaquia, escribió el analista retirado de la agencia Brian Latell en su libro Castro’s Secrets: Cuban Intelligence, the CIA and the Kennedy Assassination ( Los secretos de Castro: la inteligencia cubana, la CIA y el asesinato de Kennedy). El gobierno canadiense anunció en 1995 que a su embajada en La Habana se le había informado que las autoridades cubanas habían arrestado a Terpil, pero no dió detalles sobre las razones de la detención o de qué pasó con él después de eso. Un extranjero que vive en La Habana dijo que en el 2000, durante una función de ballet, un amigo cubano le señaló a un hombre sentado cerca de ellos y lo identificó como Terpil. El hombre estaba acompañado por una mujer cubana más joven que él, dijo el extranjero. Terpil huyó de Estados Unidos luego de que fiscales federales lo acusaran a él y a su socio de negocios Ed Wilson de conspiración para cometer asesinato y de vender explosivos plásticos a Libia. Una corte del estado de Nueva York lo había sentenciado anteriormente a 53 años de prisión luego de enjuiciarlo en ausencia por cargos de conspiración para contrabandear 10,000 armas semiautomáticas. 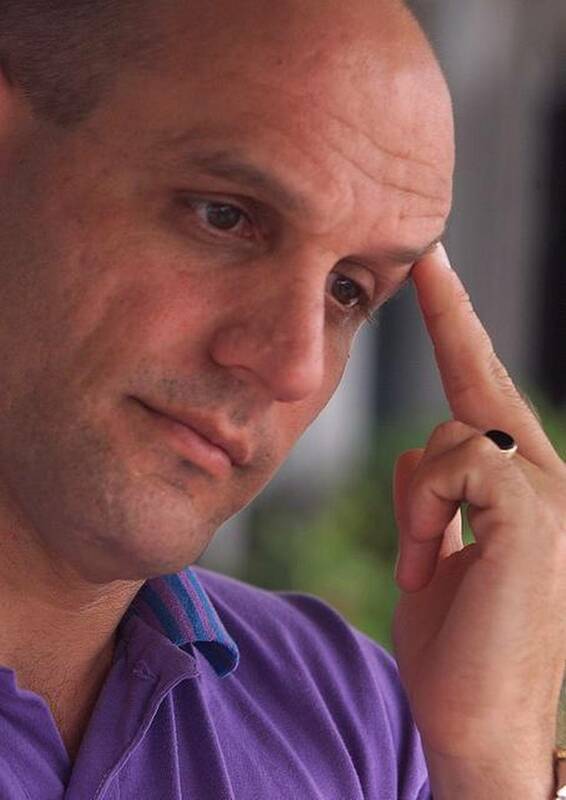 Chrisman dijo que durante la entrevista de La Habana para el documental —producido por Fresh One Productions para el canal Showtime— Terpil admitió que había ayudado a Gadhafi a manejar una campaña para encontrar y asesinar a los enemigos del dictador libio en el extranjero. “Yo lo llamaría Asesinatos Incorporados, sí, asesinato por contrato. Gadhafi creía que todo el que fuera disidente debía ser eliminado”, dijo Terpil. En un caso, agregó, el dictador quería que le trajeran la cabeza de uno de sus enemigos en una hielera. Dijo Chrisman que Terpil también relató haber contratado a dos exiliados cubanos de Miami, y haberles dicho que debían asesinar a Ilich Ramírez Sánchez, el terrorista conocido como Carlos el Chacal. Los cubanos rehusaron al percatarse de que el blanco verdadero era un enemigo de Gadhafi, agregó. “Terpil no expresó ningún remordimiento o duda al contar la historia de manera muy factual, con un toque de humor morboso, acerca del tiempo que pasó ayudando a dirigir y conseguir suministros para la campaña internacional de terror de Gadhafi”, dijo en un comunicado de prensa para el documental. Nacido en Nueva York, Terpil ha dicho que fue obligado a renunciar a la CIA luego de que la agencia se enterara de que cuando él estaba asignado en la India, había llevado a cabo un negocio de dinero a través de Afganistán para su beneficio financiero personal. El ha reconocido haber trabajado para dictadores como Idi Amin de Uganda, Saddam Hussein de Irak, y Anastasio Somoza de Nicaragua, así como para los gobiernos de Arabia Saudita, Irán y Egipto. Y ha alegado en ciertas ocasiones, a veces dando evidencia, que tenía aprobación de la CIA para algunas de sus supuestas operaciones no oficiales. Terpil era un amigo cercano de Ted Shackley, un director adjunto de operaciones encubiertas de la CIA que falleció en el 2012. James Olson, former chief of counterintelligence at the CIA and senior lecturer at Texas A&M’s Bush School, and Michael Waguespack, former senior counterintelligence executive with the FBI, described how the U.S. faces a threat rarely seen or heard of by the public — spying. “There are friendly countries, but there are no friendly intelligence services,” Olson said. Olson and Waguespack described a world hidden from the public, where countries use sophisticated spy networks to steal U.S. political and technological secrets and to compromise U.S. spy networks abroad. Olson named China, Russia and Cuba as the primary threats in U.S. counterintelligence. “Never in my memory has our country been more in peril at home and abroad than it is right now,” Olson said. Olson said foreign intelligence agents use a wide variety of covers to seek U.S. intelligence, from business and diplomatic covers to student identities. Olson said the Chinese, for example, have gained access to U.S. nuclear weapons data and sophisticated technology that has allowed them to upgrade their combat aircraft and submarines to levels more advanced than their domestic technology would allow. Newly declassified documents show that former CIA Director Leon Panetta revealed secret information to "Zero Dark Thirty" scriptwriter Mark Boal, who was allowed to attend Panetta's speech at CIA headquarters marking the raid that killed Osama bin Laden. In a statement, Panetta says he had no idea Boal was in the audience when he gave the speech. He says he assumed everyone inside had proper clearance. CIA spokesman Dean Boyd says the agency has since "overhauled its procedures for interaction with the entertainment industry after an extensive internal review." (CNN Español) – "Entré a la habitación. Me paré enfrente y le dije: 'Comandante lo siento. Yo he tratado'. Se puso blanco como un papel; sin embargo se recompuso y me dijo: ‘es mejor así. Yo nunca debí caer preso vivo'". En el 46 aniversario de la muerte de Ernesto 'Che' Guevara, Félix Rodríguez, el hombre que fue clave en su captura y ejecución, narra los pormenores de los últimos momentos de la vida del argentino. En una entrevista con CNN en Español, Rodriguez, cubano-estadounidense y exagente de la CIA, revela detalles no conocidos acerca del 'Che', del asesinato de John Fitzgerald Kennedy, de su relación con el presidente argentino Juan Domingo Perón y su opinión sobre la dependencia que tiene de Venezuela del régimen cubano. Sobre el final de la vida del 'Che', Rodríguez describe cómo estaba el líder guerrillero al momento de su captura y quién estuvo detrás de su muerte. “Él estaba moralmente destruido (...) Tenemos que estar conscientes de que a él lo mandó a eliminar (Fidel) Castro. El 'Che' Guevara era pro-chino y era una cosa que Cuba no podía permitir porque dependía cien por cien de la Unión Soviética”, dice Rodríguez. Esta hipótesis la desarrolla Rodríguez en función de los acontecimientos previos a la llegada del 'Che' a Bolivia. En primera instancia —explica el exagente— Guevara fue marginado luego de tener una pelea física con el embajador soviético en una recepción en la embajada cubana en El Cairo. Además, para Rodríguez, varios factores indican que la presencia del revolucionario en Bolivia estuvo marcada por obstáculos deliberados: por un lado, "el transmisor que le mandan está roto"; adicionalmente, el líder del partido comunista boliviano —que había estado dos meses antes en Cuba— le retiró todo el apoyo al movimiento guerrillero del 'Che'; y, finalmente, retiraron al oficial de inteligencia cubano que viajó a Bolivia para darle apoyo "con el pretexto de que se le había vencido la visa", a pesar de que después se supo que "tenía la ciudadanía boliviana". "O sea, realmente lo mandaron para eliminarlo", concluye Rodríguez. Félix Rodríguez también involucra a Fidel Castro en el asesinato de John F. Kennedy, una acusación que el líder cubano ha negado en repetidas ocasiones. 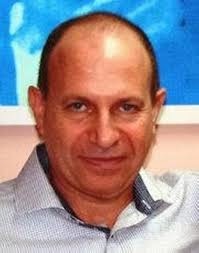 Según Rodríguez, aunque hubo otros elementos implicados en el homicidio del presidente estadounidense, el régimen de Cuba habría sido el ejecutor. CNN en Español contactó a la Sección de Intereses de Cuba en Estados Unidos para obtener una declaración oficial sobre estos temas, pero aún no ha recibido respuesta. Not open to the public but displayed inside CIA headquarters are artifacts from decades of intelligence gathering, including drones disguised as insects, a pigeon camera and Osama bin Laden's AK-47. The “coolest museum you’ll never see” has a new piece de resistance – the gun found next to the body of Osama bin Laden in Pakistan when Navy SEALs killed him in a midnight raid. 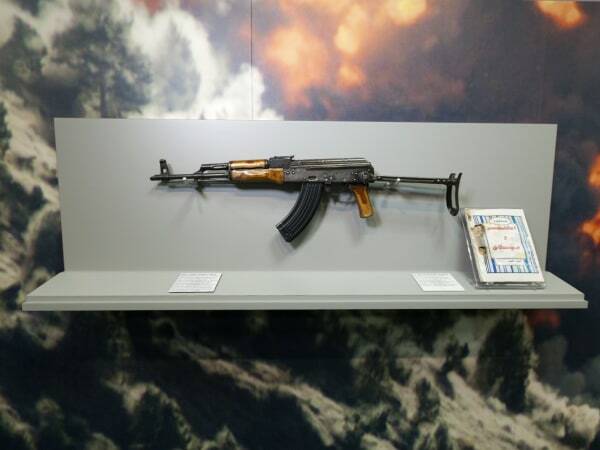 The AK-47 is a recent addition to a collection that’s among the toughest tickets in the country for museumgoers. Tucked into various hallways at CIA headquarters in Langley, Va., the museum displays the gadgets, artifacts and trophies of 70 years of spycraft, from World War II through the War on Terror. Closed to the public, it had only been visited by employees and invited guests until NBC News recently became the first news organization allowed to bring in video cameras. The Russian-made assault rifle, identified on a simple brass plaque as “Osama bin Laden’s AK-47,” shares a glass case with an al Qaeda training manual found in Afghanistan soon after 9/11. Watch Richard Engel's report Wednesday on "NBC Nightly News with Brian Williams." "This is the rifle that was recovered from the third floor of the Abbottabad compound by the assault team," said curator Toni Hiley. 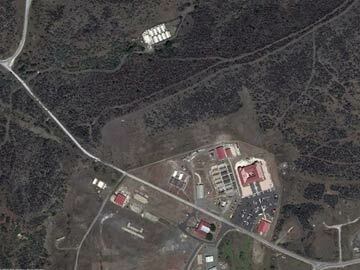 "Because of its proximity to (bin Laden) there on the third floor in the compound, our analyst determined it to be his. It's a Russian AK with counterfeit Chinese markings." Neither Hiley nor the agency will say how the AK-47 got to the museum, other than that the agency director at the time of the operation, Leon Panetta, "asked that it come into the museum collection," said Hiley. But one source told NBC News that it came from the "dark side" of the agency, the operations staff that worked with the SEALs on the May 2011 raid. The agency also will not comment on the specifics of how the weapon was recovered or whether it was loaded when retrieved. Tony Hiley, Director of the CIA Museum, shows NBC's Richard Engel what she considers one of the most unique pieces in the museum, the A-12 Oxcart plane, which was designed to be the successor to the U-2 spy plane. "I wasn't there," said Hiley. "So I can't confirm or deny exactly where the weapon was. I just know that I have it in my museum and I'm happy to have it." In the movie "Zero Dark Thirty," which was written in consultation with military and intelligence sources, a member of the assault team is shown grabbing the weapon from a shelf above bin Laden's bed in his third-floor bedroom moments after the al Qaeda leader’s death. Hiley said the weapon is in good working condition, but that the origin of the Chinese markings is a mystery. She said it’s not the weapon seen at Osama’s side in many propaganda videos. CIA museum curator Toni Hiley holds an "insectothopter" created by the CIA's Office of Research and Development during the 1970s and intended to gather intelligence unobtrusively. Designed to look like a dragonfly, the insectothopter's tiny gas-powered engine moved its wings up and down. While flight tests were impressive, it proved difficult to control when any wind was present. Bin Laden’s gun is part of a new trove of artifacts, the spoils of the War on Terror. "I think for our people it's an acknowledgment that the hard work over that 10 years and partnership with other members of the intelligence community and partnership with the military was a success,” said Hiley. “This puts the punctuation point on 10 years of this agency and our intelligence community partners looking for bin Laden." In addition to bin Laden’s gun, there's a brick from his compound in Abbottabad; a scale-model of the compound; a section of a wall that was part of the life-size mock-up of the compound used by the SEALs to train for the raid; and several al Qaeda training manuals found in Afghanistan, including a partially burned guide to firing surface-to-air missiles. There’s also a chest filled with football-sized chunks of blue and white lapis lazuli stones, one of a dozen chests of the rare stones seized by the CIA in Afghanistan. Hiley referred to the trunks as "al Qaeda's ATM." Al Qaeda used the raw lapis lazuli, which goes for $200 to $1,200 a kilogram, to circumvent banks and pay its fighters. "It's as accurate as those hundreds of pieces of intelligence would permit," said Hiley, when asked if the spare tires in the yard matched intelligence reports. "Not only are they looking at that intelligence, they're going to the analysts and asking them, 'Was the wire this far apart?' So they're trying to get absolutely every single bit of truth into this model because they know the model will be used." Nearby is a piece of the wall, topped with barbed wire, from a full-scale mock-up that the CIA constructed for SEAL training at a facility in Harvey Point, N.C. The life-size mock-up was destroyed not long after the May 2011 raid, but before it disappeared, an internet sleuth found satellite images. 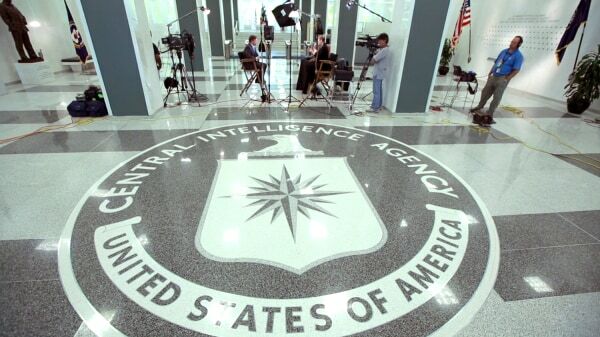 NBC News Chief Foreign Correspondent Richard Engel interviews CIA museum curator Toni Hiley at CIA headquarters in Langley, Va.
“That's why these pieces are important. That's why they're in this museum." Some images from the collection are viewable online via the agency’s website, so while the museum is off-limits to the public most of its contents are not unknown. There is, of course, another secret museum behind the not-so-secret” museum, a “classified collection” kept in a secret warehouse, from which curators will sometimes pull new items to display. Asked if this classified collection was more like a police evidence locker or the basement of the Smithsonian, Hiley said it was like neither. "Oh," she said, "it's much cooler than that." Coming on Thursday: Among CIA museum's prizes, an American love letter on Hitler's stationery. A 29-year-old American who works as contract employee at the National Security Agency is the source of The Guardian's disclosures about the U.S. government's secret surveillance programs, the London newspaper reported Sunday. Edward Snowden, 29, who claims to have worked as a contractor at the National Security Agency and the CIA, allowed The Guardian and The Washington Post to reveal his identity Sunday. Snowden, in a video that appeared on the Guardian’s website, said two NSA surveillance programs are wide open to abuse. "Any analyst at any time can target anyone. Any selector. Anywhere," Snowden said. "I, sitting at my desk, had the authority to wiretap anyone, from you or your accountant to a federal judge to even the president if I had a personal e-mail." Snowden said he was a former technical assistant for the CIA and a current employee of defense contractor Booz Allen Hamilton, which released a statement Sunday confirming he had been a contractor with them in Hawaii for less than three months. Company officials have promised to work with investigators. Snowden told the Guardian he believes the government could try to charge him with treason under the Espionage Act, but Mark Zaid, a national security attorney who represents whistle-blowers, told The Associated Press that that would require the government to prove he had intent to betray the United States. Snowden has said his “sole motive” was to inform the public and spur debate. "My sole motive is to inform the public as to that which is done in their name and that which is done against them," Snowden told the Guardian. In a note accompanying the first set of documents he provided to the newspaper, Snowden wrote: "I understand that I will be made to suffer for my actions," but "I will be satisfied if the federation of secret law, unequal pardon and irresistible executive powers that rule the world that I love are revealed even for an instant." Snowden told the Post he was not going to hide. "Allowing the U.S. government to intimidate its people with threats of retaliation for revealing wrongdoing is contrary to the public interest," he said in the interview published Sunday. Snowden said he would "ask for asylum from any countries that believe in free speech and oppose the victimization of global privacy." Snowden is now staying in Hong Kong and seeking asylum outside the United States, possibly in Iceland, The Guardian reports. If the reports are accurate, Snowden could face many years in prison for releasing classified information if he is successfully extradited from Hong Kong or elsewhere. The Office of the Director of National Intelligence declined to comment on Snowden's disclosure, saying the issue has been referred to the Justice Department. However, the agency said: "Any person who has a security clearance knows that he or she has an obligation to protect classified information and abide by the law." "The Department of Justice is in the initial stages of an investigation into the unauthorized disclosure of classified information by an individual with authorized access," Justice Department spokeswoman Nanda Chitre said in a statement late Sunday. New York Republican Rep. Peter King, chairman of the Homeland Security Subcommittee on Counterintelligence and Terrorism and a member of the Select Committee on Intelligence, said: "If Edward Snowden did in fact leak the NSA data as he claims, the United States government must prosecute him to the fullest extent of the law and begin extradition proceedings at the earliest date. The United States must make it clear that no country should be granting this individual asylum. This is a matter of extraordinary consequence to American intelligence." In a nearly 13-minute video that accompanied The Guardian story Sunday, Snowden says he has no intentions of hiding because he has done nothing wrong. The Guardian broke the story late Wednesday that the federal government was collecting phone call records from Verizon customers. The Guardian and the Post followed with a series of reports about the calls being taken from other telecommunications companies and that the NSA and FBI have a Internet scouring program, code-named PRISM, that records Internet activities, all part of a post-9/11 effort to thwart terrorism. White House spokesman Josh Earnest said the Oval Office would not comment on Snowden before Monday. Washington officials have acknowledged all branches of the federal government — Congress, the White House and federal courts — knew about the collection of data under the Patriot Act. Still, the leaks have reopened the debate about privacy concerns versus heightened measure to protect against terrorist attacks. They also led the NSA to ask the Justice Department to conduct a criminal investigation. National Intelligence Director James Clapper has decried the leaks as reckless. And in the past days he has taken the rare step of declassifying some details about them to respond to media reports about counterterrorism techniques employed by the government. “Disclosing information about the specific methods the government uses to collect communications can obviously give our enemies a ‘playbook’ of how to avoid detection,” Clapper said Saturday. PRISM allows the federal government to tap directly into the servers of major U.S. Internet companies such as Google, Apple, Microsoft, Facebook and AOL, scooping out emails, video chats, instant messages and more to track foreign nationals who are suspected of terrorism or espionage. The chief executives of Facebook and Google have said their companies were not aware of the data grab. Officials say the government is not listening to any of the billions of phone calls, only logging the numbers. President Obama, Clapper and others also have said the programs are subject to strict supervision of a secret court. Obama said Friday that the programs have made a difference in tracking terrorists and are not tantamount to "Big Brother." The president acknowledged the U.S. government is collecting reams of phone records, including phone numbers and the duration of calls, but said this does not include listening to calls or gathering the names of callers. "You can't have 100 percent security and also then have 100 percent privacy and zero inconvenience,” he said. “We're going to have to make some choices as a society." However, the president said he welcomes a debate on that issue. The Guardian reported that Snowden was working in an NSA office in Hawaii when he copied the last of the documents he planned to disclose and told supervisors that he needed to be away for a few weeks to receive treatment for epilepsy. Snowden is quoted as saying he chose Hong Kong because it has a "spirited commitment to free speech and the right of political dissent" and because he believed it was among the spots on the globes that could and would resist the dictates of the U.S. government. Hong Kong has an extradition treaty with the United States that took force in 1998, according to the U.S. State Department website. "The government could subject him to a 10- or 20-year penalty for each count," with each document leaked considered a separate charge, Mark Zaid, a national security lawyer who represents whistle-blowers told the Associated Press. Snowden is quoted as saying he hopes the publicity of the leaks will provide him some protection. "I feel satisfied that this was all worth it. I have no regrets," Snowden told the Guardian. Snowden was said to have worked on IT security for the CIA and by 2007 was stationed with diplomatic cover in Geneva, responsible for maintaining computer network security. That gave him clearance to a range of classified documents, according to the Guardian report. "Much of what I saw in Geneva really disillusioned me about how my government functions and what its impact is in the world," he says. "I realized that I was part of something that was doing far more harm than good."